Get a great night's sleep using our lightweight 300 thread count cotton sateen silky duvet cover set. The beautiful blossoms of the sweetbrier flower is fashionable, while the four corner ties are convenient and practical holding your insert in place. This chic duvet cover with matching shams is the perfect choice when updating your bedroom décor. Soft quality bedding at an affordable price is Southshore Fine Linens promise to you. Purchase risk free with a 90- day limited manufacturer warranty. Smooth cotton feel and high quality finish!! This is really a beautiful, comfortable and a very high quality duvet cover set. The smooth cotton sateen feels rich to the touch without being too heavy. I bought matching Sheet set in this design as well. Comes with tabs in the corners to hold the comforter in place and button Closures. I also ended up buying the comforter from this company (southshore fine linens) as the comforter matches the exact dimensions of the duvet cover set. Holds up very well after washing. I originally bought this for my guest bedroom but after opening the duvet cover, i ended up keeping it for my room. Very happy with the purchase. Will purchase the blue color as well! The duvet cover and pillow shams are gorgeous. I love that you can turn them over for a new look. They are soft and have washed well. The quality of the duvet cover is terrific (300 thread count) and the color of light grey just right for me. Great price. This duvet cover is pink, and fresh and I just love it. Beautiful. Color is true to what's on the site. Didn't shrink when I washed and dried it. Has ties to anchor duvet inside cover. Pillow shams are right size for king pillows. A tad bit too big. Absolutely beautiful and classy looking. The fabric is more like a silk and the color is stunning. The only issue I have is the duvet is sized a bit large. I have a twin goose down and this duvet cover size states twin to full which is odd, so it’s a bit large where I had to purchase duvet clips. Other than that. Would purchase again and recommend to a friend. I Purchased this duvet cover and am happy with the purchase. I like the soft blue color and the pillow case covers are very nice as well. 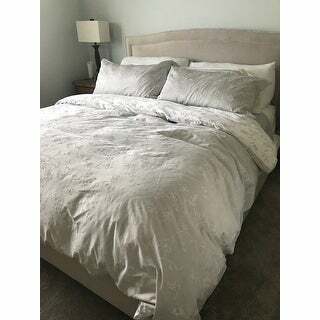 I ordered grey/white in king size which works perfectly with the decor and size of my California King. I was not expecting the pattern to be applied to the sateen in a non-fabric type of substance. I want to say some type of paint? It comes pretty wrinkled, so I wanted to smooth it out in the dryer on a steam setting which required medium heat. The instructions say to dry on low setting. So I used a steamer iron, which then wrinkled the paint of the pattern. It’s not bad looking but not sure how long the pattern will last if it has to be washed and dried a few times. Overall I really like it and think it works well. I love this duvet cover set. The cotton is very soft and the print is very soft and muted. So happy I chose this cover set, and would recommend it to anyone who wants a subtle print and soft cotton. Sometimes people post that after washing their purchase, the item doesn't hold up. How many of us would ever put linens on the bed without washing first? It's integral that the product hold up well. I'm very happy to report this product held up beautifully. The design and color are exactly as pictured. This duvet and pillowcase set looks excellent against our new ice-gray walls. I paired this with dark gray velvet drapes, also purchased from overstock. Overstock is offering opportunities for families on a budget to pull together upscale interior design looks without breaking the bank. The quality of this product is excellent and clearly great care was taken in packaging and inspecting the product pre-sale. 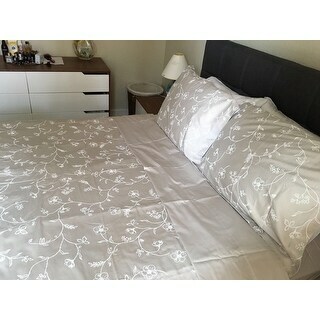 Nice duvet set, it is only 300 thread count 100% cotton but looks better than 300 count. I really like the set, I got the lunar gray and it is beautiful, very soft color goes with everything. I just wish that it had a zipper instead of buttons. I was looking for duvet cover, light, easy to clean & great for Florid a weather. Like the design, price was relatively good. But soon more sales were offered to me upon my purchase, ahhh, no biggies as there's more to look at. I was not pleased at all with the color:lunar grey, it has a brown yet purple hue in it. This is my 1st ever complaint. Not right for me but I shouldn't stop anyone from purchasing, as 2 of my 5 friends like it! I'll still ship at overstock.com. Ty. Great items for less money! Looks stunning on a cherry wood four poster bed! 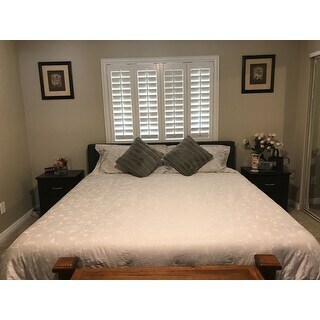 Mom absolutely loves it in her bedroom, definitely 5 stars!! This duvet cover is exactly like the picture. Very soft pattern that goes to a taupy grey vs classic grey which works for me. My only negative is that it wrinkles pretty easily, and needs ironing out of the package for sure as did not fall out naturally. Overall, I'm pleased with this purchase. A relaxed look because of the wrinkles. 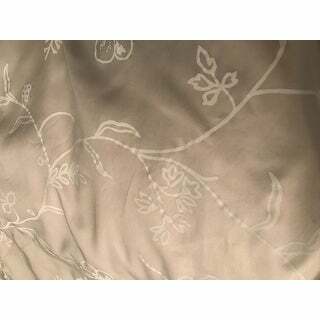 I am disappointed in the Boutique Chic Sweetbrier Reversible Cotton Duvet Cover Set. The feel is nice and what I expected however, the design is nothing like what I expected. The picture displays a design that looks like it is sewn or appliqued onto the material. The one I received is a stamped print and looks nothing like the picture. I needed the cover or would have sent it back. It is the only item I have ever ordered from Overstock that has not been exactly what I ordered and I hate to complain. I feel sure it is a designing mistake and one that was out of their control. Disappointed because it was very thin and more like a sheet weight. Much lighter than picture on website (sand) but overall I like the look. such a beautiful set! flowers look very gentle and color is amazing sky blue. Exactly as depicted. Fabric soft but sturdy with matching pillow covers. I really like the the pattern ... simple but elegant always. Love the color and the pattern. Material is soft and smooth. It will look very pretty when the real duvet arrives! "This set is described as reversible. Is the reversible side identical? or a single color?" The reverse side has colored background and white flowers. 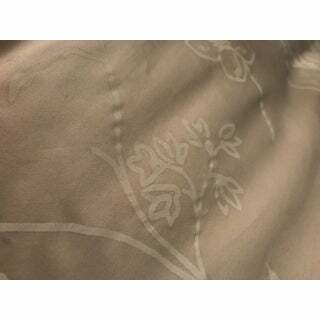 "Where do I find details on the Soft Shabby Sweetbriar duvet set? Size? Fabric? Etc." "Where do I find details on the Sift Shabby Sweerbriar duvet set? Size? Reversible?" "is the pastel pink more like a dusty rose color?" "Does the sweetbriar duvet cover set come in king ?" "Wanting to know if a queen duvet insert that measures 98by98 fit into a queen duvet cover 92by 92." "Will you be getting more of the Lunar Gray in the King size?"